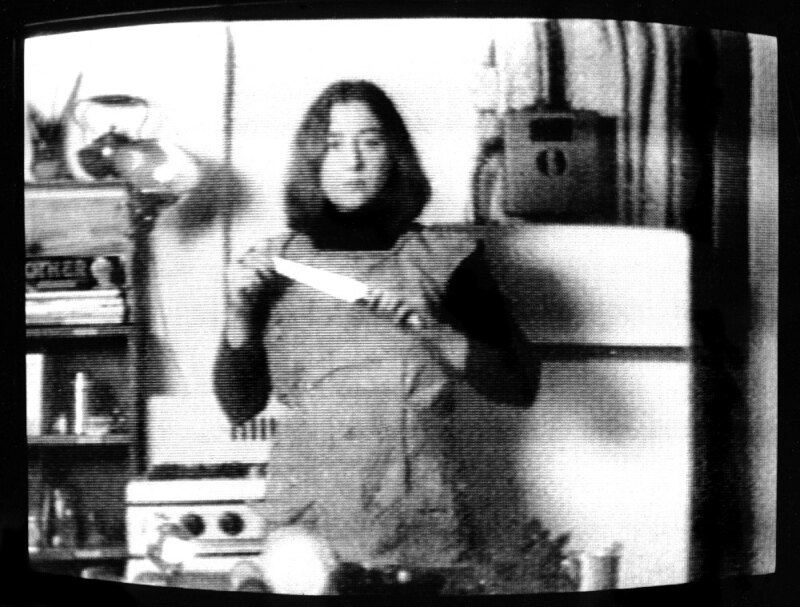 Martha Rosler was born July 29th 1943 in Brooklyn, New York. She studied her B.A. from Brooklyn College in 1965 and her M.F.A. from the University of California, San Diego in 1974. She currently lives in Brooklyn, New York. For a long time she was considered to be an "underground artist", as she pioneered using different media and combining them. 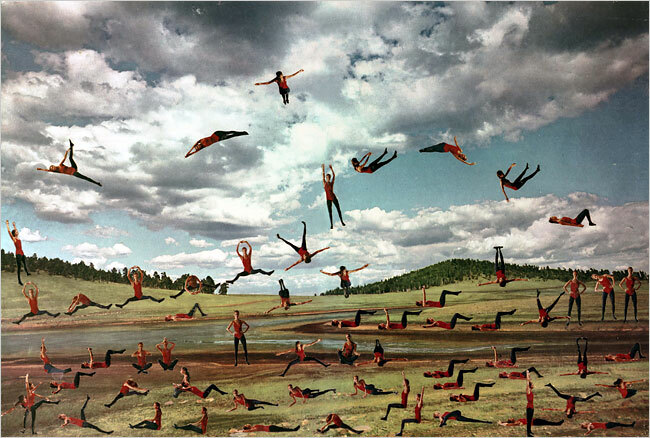 Martha Rosler uses a variety of mediums, but her most recognizable medium is photo-collage and photo-text. She also works creates video installations and performance art. 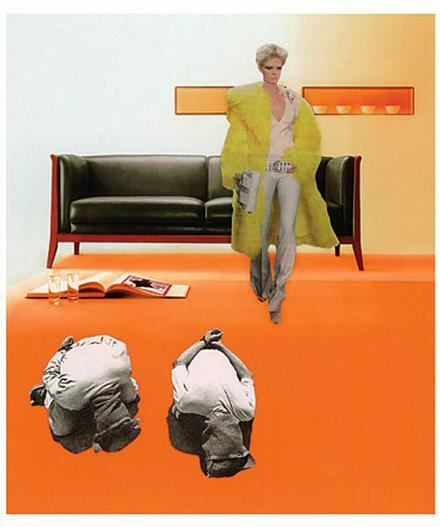 Her work frequently contrasts the domestic lives of women with international war, repression and politics, and pays close attention to the mass media and architectural structures. 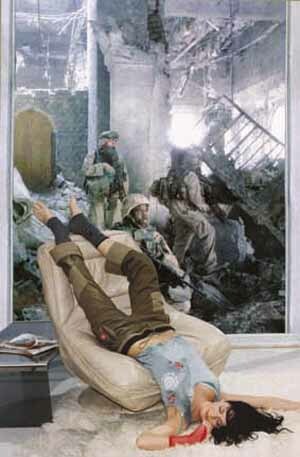 Her work has been displayed in several Whitney biennials, London's Institute of Contemporary Art and New York's MoMA. In 2000 a retrospective of Rosler's work was held in New York, Birmingham, Vienna, Lyon/Villeurbanne, Barcelona and Rotterdam. She has a series of solo exhibitions at the University of Rennes (2006) and at the Worcester Museum of Art (2007). 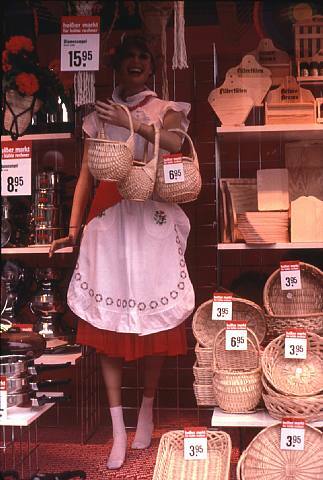 Some of her earliest video artworks are "Semiotics of the Kitchen" (1974-75), "Vital Statistics of a Citizen, Simply Obtained" (1977), "Losing: A Conversation with the Parents" (1977). 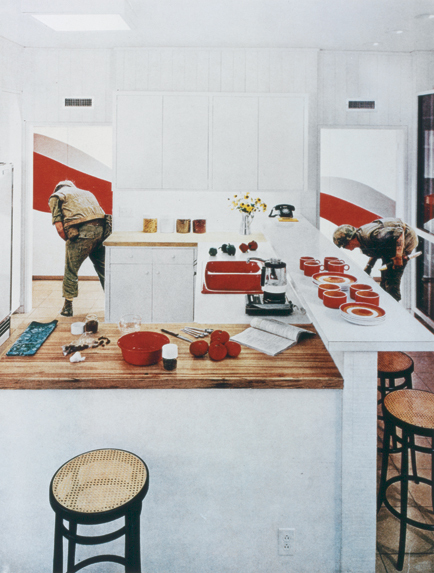 Some of Martha Rosler's more famous works is her photomontages "Body Beautiful, or Beauty Knows No Pain" (1966-72) and "Bringing the War Home: House Beautiful" (1967-72; reprised in relation to the War in Iraq in 2004). 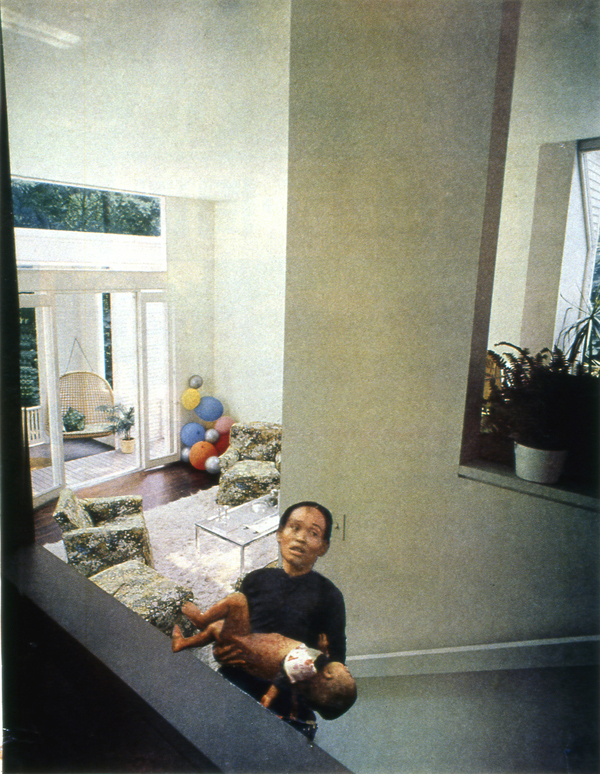 In 1989 Martha Rosler and a group of artists, architects, city planners, students and homeless people organized the project "If You Lived Here...", which addressed living conditions in urbans environments, architecture and utopian ideas. Rosler was awarded the Spectrum International Prize in Photography for 2005, the Oskar Kokoschka Prize (Austria's highest fine arts award) in 2006, and the Anonymous Was A Woman Award in 2007. 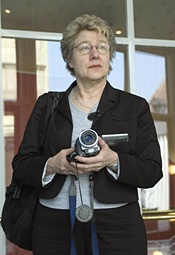 She is also known for her writing and her lectures and has toured her lectures internationally in addition to publishing 15 books and textbooks on the role of photography and art, public spaces and expressing an interest in airports, roads, transportation and public housing/homelessness. Smaller examples of her writing have been published in magazines like Artforum, Afterimage, Grey Room, Quaderns and NU Magazine. 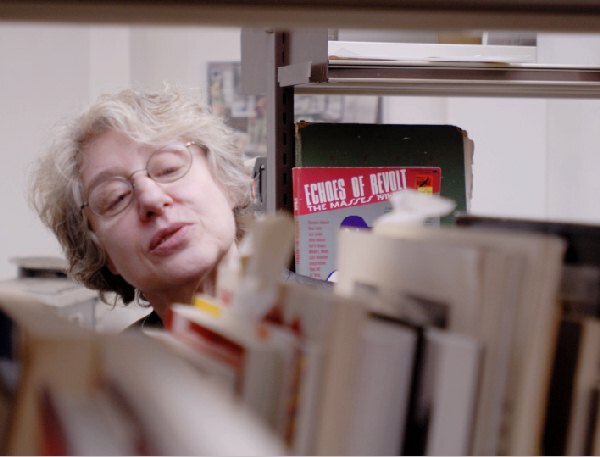 Her book collection (7,500+) also went on international tour in 2007 as the "The Martha Rosler Library" and has thus far toured New York, Frankfurt, Berlin, Antwerp and Paris. 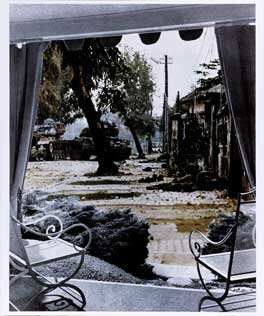 Her 1981 essay on documentary photography "In, around, and Afterthoughts" has been widely republished & translated, is about myths of photographic disinterestedness and how people determine meaning from photographs. If You Lived Here (Free Press, 1991). Rights of Passage (NYFA, 1995). 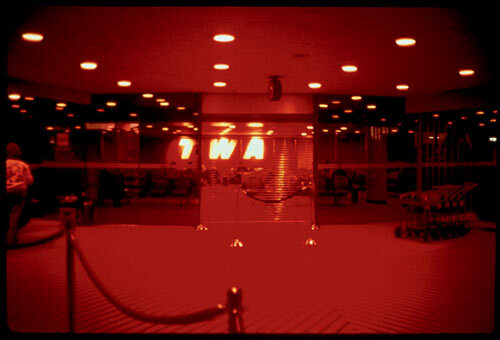 In the Place of the Public: Airport Series (Cantz, 1997). Decoys and Disruptions: Selected Essays 1975-2001 (MIT Press, 2004). Passionate Signals (Cantz, 2005). Click here to browse the Art History Archive. 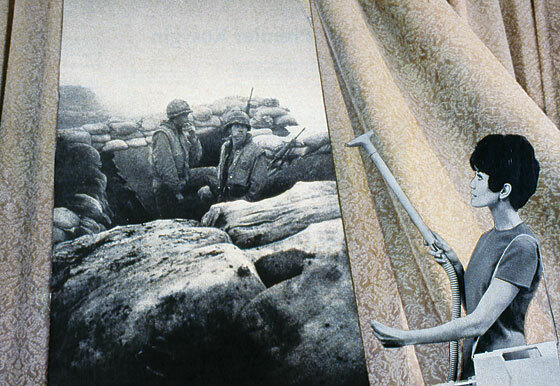 “So much of my work involved the Vietnam War that it would have been obscene to show it in a gallery. But now, it’s different; it’s important to remember and to enable the young to discover what to some of us is still so present.” - Martha Rosler. “Movement defines the era. Looking back on the century, we understand the linkage of information and transportation (and their inevitable dark double, mass death) - movement of people as well as of goods…The separate worlds of the ‘underground’ and of air travel mirror each other, for each requires a population controlled, surveilled, and kept from panic…The rapid movement through subway tunnels evokes flight (especially for child travelers) while the effort of airlines is to deny its reality. Both forms of transport answer to the most rational need of capital but at the same time evoke a world of experience both conscious and unconscious. This maps out for us the world of the everyday, the common ground of both "reality" and metaphor.” - Martha Rosler, in Dream and Transports. "It was these two projected spaces, one idealized and the other cast completely into the other mode. It showed a picture of who we thought we might be if we only strove hard enough, our best selves, versus this picture of the rejected space. It just seemed like this is the way it had to be shown. It wasn’t about contrasting two realities, but two world views: our ideal self and this other thing which was the unacceptable reality of another place. One suggested we had agency, that we could create this world, and the other suggested that we had no agency, that others had agency, the military or elected leaders or terrorists, though that’s not the lingo of the day, other geopolitical forces. This was not an arena that we had any power over." 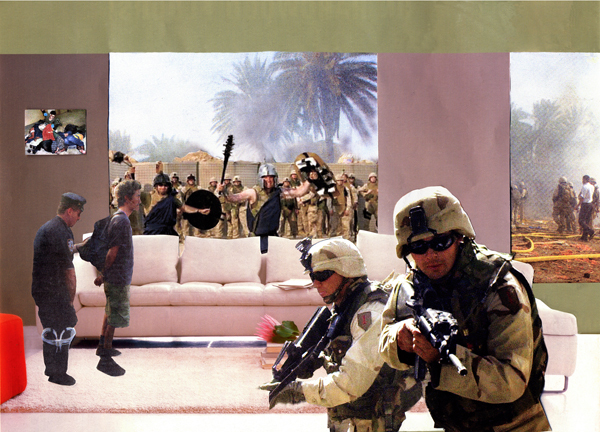 - Martha Rosler, on "Bringing the War Home: House Beautiful". "I wanted to – even at the loss of some self-pride – to go back to something that I had done many years before in exactly in the same way, or as close a way as I could, to say ‘you know this work of mine now’ for those who did, I must return to exactly the same form because we have sunk back to that same level, of a kind of indifferent relationship to what our country is doing. I wanted specifically to evoke a mood and invoke a way of working, to say, "Tout la change, tout la même chose." 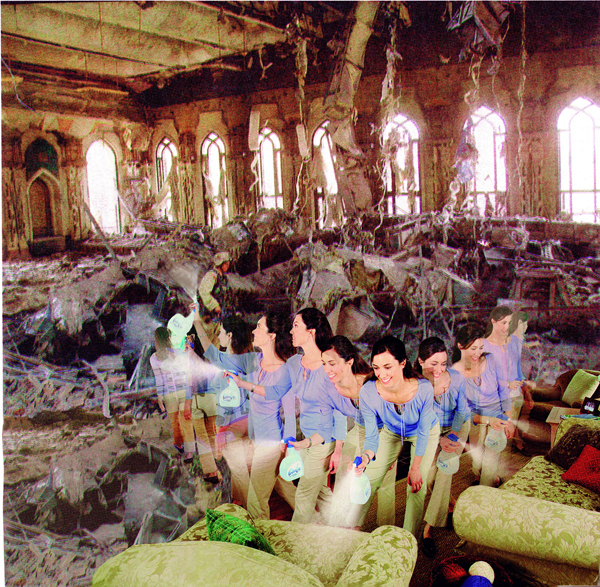 - Martha Rosler, on "Bringing the War Home: House Beautiful".